Dr. Agnes Sides is a physician assistant with specialties in the field of immunology, asthma, and allergy. Having about 11 years of experience, she treats both children and adults and provides quality care. Dr. Agnes Sides got her bachelors in Physician Assistant Studies from Touro College. She also got PA training from Cornell University. She currently works as a physician assistant at the Centre for Asthma, Allergy/Prohealth. Besides this, she has also worked at Maimonides Medical Centre as a Physician assistant. Dr. Agnes Sides mainly treats patients with seasonal allergies, asthma, food allergies, immune deficiencies, and apoptotic dermatitis. She also interprets blood work for various immunological, allergic, and respiratory diseases. Dr. Agnes also assists patients with complex diagnostic procedures. Despite her busy schedule, Dr. Agnes Sides always puts patients care first. She follow-ups with patients to inquire about their health. 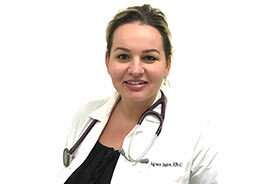 Dr. Agnes currently resides in Great Neck, New York. She speaks English quite fluently.